Did Hossa Trade Cost Senators a Stanley Cup? In the early 2000’s and long before we knew anything about zone start percentages or shot attempt differential, the old “eye ball” test told us the line of Radek Bonk, Magnus Arvedson and Marian Hossa were dominant at the possession game. All three were big and skilled while Arvedson and Hossa also added powerful speed. They cycled the puck down low with ease, playing keep away until a whistle or a goal. Remarkably in 2001, all three players also finished in the top 16 in voting for the Selke trophy. It was the first early indication that Hossa was an elite two-way player. In his first five full seasons in the NHL, from 1999 to 2004, Hossa scored 173 goals in 400 games, the fourth highest total in the NHL over that span. Only Naslund, Iginla and Hejduk scored more. He was a core piece of a young team that expected to win a Stanley Cup in the next few seasons. Hossa and his linemates were part of a forward group that in 2004 also included Alfreddson in the middle of his prime, a 22 year-old Martin Havlat, 20 year-old Jason Spezza, 23 year-old Mike Fisher and 21 year-old Antoine Vermette. The defence was led by two 26 year olds, Zdeno Chara and Wade Redden. The future looked bright. In the previous year the Senators had won the President’s Trophy but lost to the New Jersey Devils in game 7 of the Eastern Conference Final. They were just one goal away from a Stanley Cup Final appearance against the over achieving Anaheim Mighty Ducks. They followed that up with another 100 point season in 2003-04. Hossa had 36 goals (6th) and 82 points (5th) that year, in an NHL that was still at the height of its clutch and grab dead-puck era. Meanwhile Chara, Hossa’s good friend and fellow countryman, was a first team all-star and finished second in Norris Trophy voting. The team was so confident that captain Daniel Alfredsson famously proclaimed in December 2003 that “we’ll win the Cup”. Despite regular season success and a young core, the Senators made an early first round exit in 2004. That game 7 loss to Toronto spelled the beginning of the end. The fan base was irate at losing to the hated Maple Leafs for the fourth time in six years. Head coach Jacques Martin had long ago been branded by many as a regular season coach that could not win in the playoffs; likewise for the team’s many European players. By the time hockey resumed in the fall of 2005, after missing a season due to the lock-out, Martin had been fired and Marian Hossa traded. Hossa was a restricted free agent in the summer of 2005. General Manager John Muckler signed him to a 3 year $18 million contract and the team looked set to again be a cup contender. Just one day later, Muckler shockingly traded Hossa to Atlanta for Dany Heatley. It is revisionist history to now call the Hossa trade a mistake. Heatley would go on to have back to back 50 goal seasons alongside Jason Spezza. However, with the benefit of hindsight we now know that Hossa was and is an infinitely better player at either end of the rink and on both sides of the puck. His backchecks are a work of art, as entertaining as an offensive plan. True Fact: in the dictionary the definition of "backcheck" is just a picture of Marian Hossa. To compound the mistake, Chara and Redden were both set to become unrestricted free agents one year later. 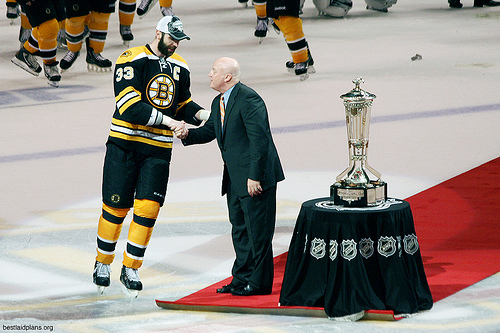 Muckler attempted to sign both to identical contracts but met resistance from Chara. It has been speculated that the organization’s treatment of Hossa was a significant factor in Chara’s decision to sign elsewhere. If there is any truth to that then the Hossa trade likely cost the Senators their best chance at a Stanley Cup. They did go to the finals in 2006-07 without either of those great players but that would be the last time the Senators made a legitimate run at the cup. The Stanley Cup Final has featured at least one of Hossa or Chara in five of the seven years since Ottawa last contended. The two have combined for 3 Stanley Cup rings and 6 finals appearances since leaving Ottawa. Would the Senators have defeated Anaheim in 2007 with Hossa and Chara? Would keeping Spezza, Alfredsson, Hossa and Chara together for a few more years yielded a Cup? Did the Hossa trade hasten Chara’s departure and cost the Senators a championship? We will never know what could have been.